Photos courtesy of College Democrats and College Republicans’ respective Facebook pages. Nov. 6 is the midway point of the Trump administration. People on both sides of the political landscape have stark opinions on the current administration. To some people, this midterm election is particularly important because of the various senate and house of representatives races across the country. Butler’s community has various political views. Indiana is a predominately Republican state. Indianapolis is a mostly liberal city. As a liberal arts school, Butler is more liberal. This is the political microcosm of Butler’s campus and surrounding community. As a result, Butler students said they experience varying degrees of support when expressing their political views inside and outside of the classroom. James Cecil, a senior political science and Spanish major, is the president of College Republicans. She said that as a Republican, she has to pick and choose when to express her views. Sophie Ciokajlo, a first-year dance performance major, is a Democrat. She said she feels she has experienced more open-mindedness at Butler than in her hometown of Stamford, Connecticut. Jon Gray-Smith, a sophomore political science major and the vice president of College Republicans, has found more support with fellow Republicans than with other people on campus. Greg Shufeldt, an assistant professor of political science, does not divulge his political beliefs due to his research on political parties. Being at a liberal arts school in a Republican state, Democrat and Republican students are met with opposing viewpoints in their friend groups and in campus activities. Cecil has not let her political views affect who she chooses to spend time with outside of the classroom. “I feel like it doesn’t hinder my social life because the friends I choose don’t judge each other based on political views,” Cecil said. Olivia Holabird, a junior arts administration major, is a Democrat from California. She has many friends who are Republicans, but she chooses her friendship carefully depending on how extreme someone’s views are. Ciokajlo has not had many political discussions with her peers, and the only time a political viewpoint has been expressed was during major events like the Kavanaugh hearings. Gray-Smith said his political beliefs affect both his academic and social lives on campus. Political stereotypes, especially with the current political climate, have divided people across party lines. Some Butler students are looking to break those molds and maintain that not all Democrats and Republicans are the same. One of Cecil’s major goals as president of College Republicans is to break stereotypes regarding Republicans, particularly those who are female. Gray-Smith wants to let people know, like Cecil, that Republicans are not bad people. Holabird said she believes there are also stereotypes about Democrats, and that some people see Democrats as being soft or too sensitive. Ciokajlo said she wants to break the democratic stereotypes as well and urges her fellow party members to take more action. In the upcoming midterm election, there are 35 Senate seats being contested and could ultimately decide whether the President Trump’s policies will get passed through or denied. Here in Indiana, there is a senate race getting national attention between Democrat Joe Donnelly and Republican Mike Braun. Ciokajlo has friends who are volunteering on both campaigns and finds the uncertainty of the outcome interesting. No matter your viewpoint on politics, there are various student organizations on campus to support you. 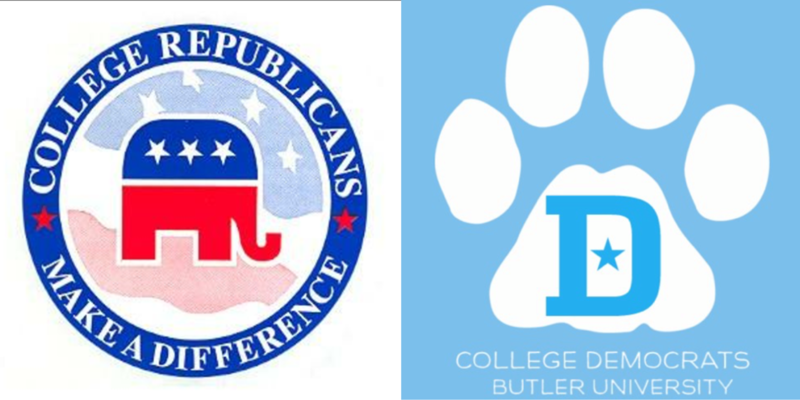 Cecil’s experience in College Republicans has been important to her experience at Butler. “There is a strong liberal presence on campus, and it is nice to allow those students with conservative viewpoints a safe space for them to share it without being discriminated against themselves,” Cecil said. Political science professor Shufeldt said he believes the university provides support for all students, both inside and outside the classroom. Regardless of which political party a student belongs to, the most important thing to remember in the coming week is to vote in the midterm elections. Gray-Smith said he thinks voting is the key to closing the wide gap between political parties and ensuring citizens are involved in the future of the state and country at large.